BANGKOK (June 18): A falling tide lowers all boats, it seems. 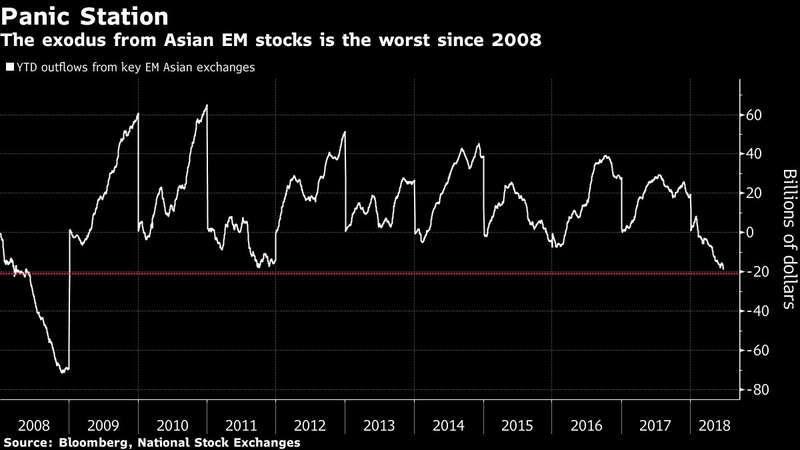 Amid an exodus from emerging markets, investors are pulling out of even Asian economies with solid prospects for growth and debt financing. Overseas funds are pulling out of six major Asian emerging equity markets at a pace unseen since the global financial crisis of 2008 -- withdrawing US$19 billion from India, Indonesia, the Philippines, South Korea, Taiwan and Thailand so far this year, according to data compiled by Bloomberg. While emerging markets shone in the first quarter, suggesting resilience to Federal Reserve tightening, that image has shattered over the past two months. With American money market funds now offering yields around 2% -- where 10-year Treasuries were just last September -- and prospects for more Fed hikes, the bar for heading into riskier assets has been raised. Headlines on trade disputes that could hit Asian exporters haven’t helped. Yet some still remain optimistic. Bank of America Merrill Lynch expects some of the regional currencies including the baht and the Philippine peso to appreciate slightly by the end of the year, a research note sent Monday showed. Six of 10 best-performing emerging currencies so far this year are in Asia, led by the ringgit’s 1.2% advance and the Chinese yuan’s 1.1% gain. In Asia this week, the Philippine central bank, which raised its key rate in May for the first time since 2014, is expected to lift the benchmark again by 25 basis points to 3.5%, a Bloomberg survey shows. The Bank of Thailand will keep its benchmark unchanged at 1.5% the same day, according to a separate Bloomberg survey, though JPMorgan for one sees an increase coming next quarter. The baht has tumbled 4.6% against the dollar this quarter, despite Thailand having a current-account surplus in excess of a whopping 9% of gross domestic product. Thailand is also in the midst of the longest stretch of 3.5% plus GDP growth since the early 2000s, according to the IMF. Thai Finance Minister Apisak Tantivorawong, for his part, said Monday he’s not concerned about capital outflows, and the country’s central bank need not follow the Fed in raising rates. Meantime, the baht hit its 2018 low in Monday trading, and the main Thai stock index was down 1.2% as of 2:02pm in Bangkok.